There’s only one reason I do not buy Ben and Jerry’s ice cream: I can eat a whole pint in one sitting! And I won’t share. 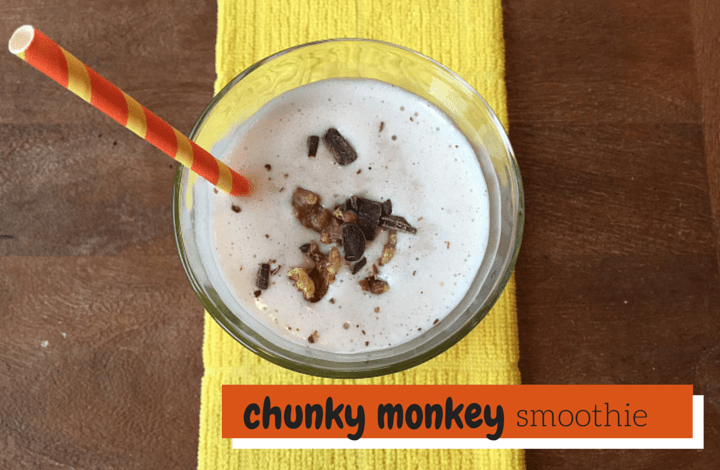 Lucky for my sweet tooth I had a craving for Chunky Monkey ice cream and decided to recreate the flavors in a lower-calorie laden chunky monkey smoothie. It’s all about compromise [aka moderation] with favorite foods, right?! Middle of the night feedings and mix and matched nap schedules for Joey and Anthony means that this Momma is pretty much running on empty. Lack of sleep = craving the sweets! Anyone else have that issue? Instead of opting for the whole pint of Ben and Jerry’s, I put my blender to work and came up with something that both fuels my day and satisfies my sweet tooth. Momma’s slurping on a chunky monkey smoothie! 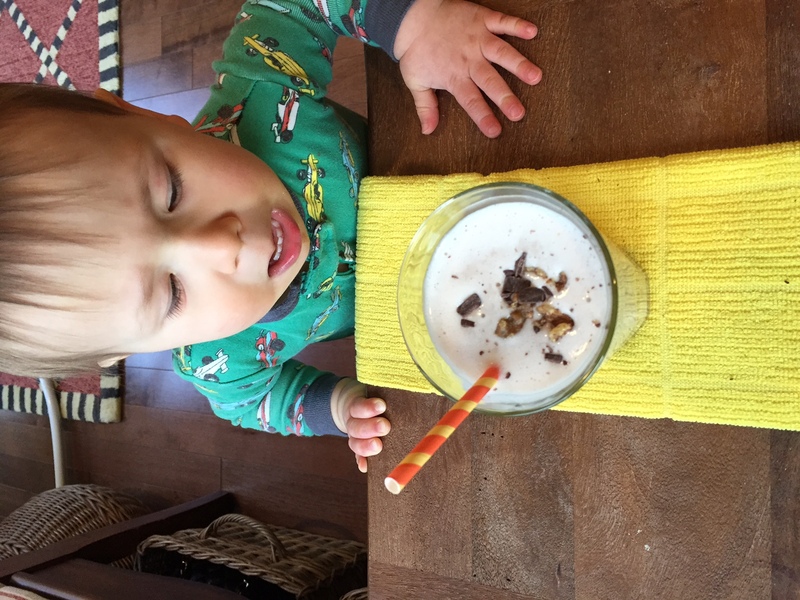 It all starts with the perfect pairing of chocolate milk + walnuts. Both of these ingredients are packed with nutrients that not only taste delicious, but they also help to fuel any busy day. Which, believe me, as a parent of two little kiddos running on limited sleep, I need all the fuel I can get. And if FUEL tastes like this chunky monkey smoothie I’m eating as much of it as I can! Add all of the ingredients to a high-speed blender. Blend until smooth. Add more ice for desired consistency as needed. Because all ice cream flavors deserve to be transformed into a smoothie, which would you choose to recreate?! Ahhhh!! Love that flavor too! I think Joey and Sienna could have a hilarious cooking show. 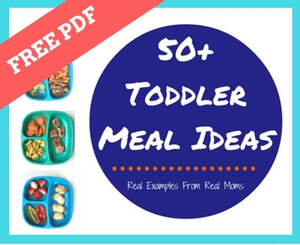 Toddlers and Tots?! We always have chocolate chips in the fridge…never thought to add them to a smoothie! Great idea!! Joey too!! I think our kiddos have a LOT in common! #1 being good cook momma’s! Wow! 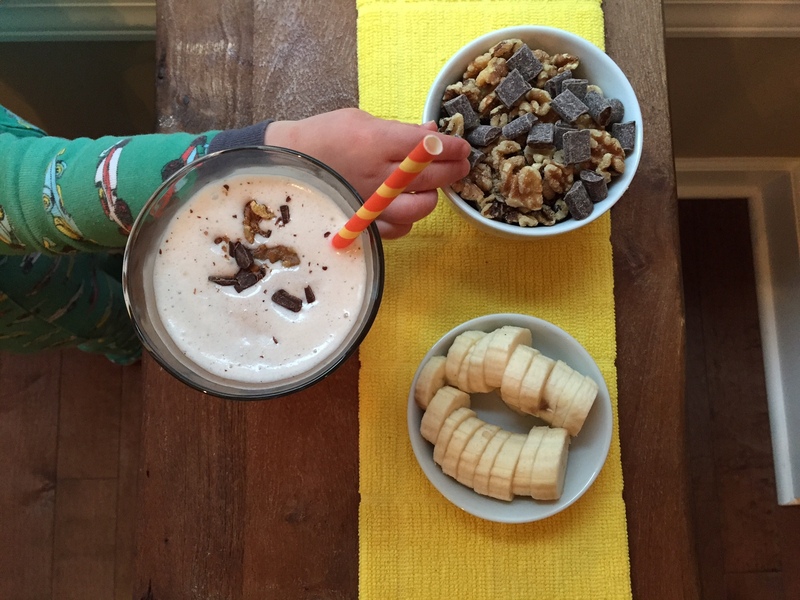 I can’t wait to try this Chunky Monkey Smoothie with allergy-free ingredients. I bet chocolate almond or coconut milk and enjoy life chocolate. I’ve never had chocolate almond milk but it sounds delicious! And definitely a substitution! yummy! I’m craving this now, Thanks Katie!! Thanks for stopping by Heather!! this is precisely my issue. My son doesn’t sleep well so my regularly bad sweet tooth is even worse than usual, and my clothes are tighter as a result. I can’t wait to try this smoothie. It sounds so good! Yep. And I’d rather drink up the sweet stuff than candy because liquids make me fuller faster 🙂 you’re not alone in this! Gotta love a good chocolate smoothie! I make a smoothie that’s similar. I’ll have to try your recipe! And my smoothies are totally my treat, and help me from eating a pint of ice cream too! It’s the best defense again Ben and Jerry’s!! Mmm! This sounds delicious! I agree, if there is a Ben &Jerry’s pint, I will eat the whole thing! I like going to the scoop shoop once or twice a year and get a single scoop and I savor every taste! I’m glad there’s not a scoop shop near me or else I’d be there weekly lol! can’t EVER go wrong with a banana chocolate combo! Yum!! I am also one of those people who can eat a whole pint of ben and jerry’s. My favorite flavor is half baked and my BF is obsessed with cinnamon buns. I’ll definitely be trying to make this – maybe with some chocolate protein powder? Thanks for sharing! That face!! Priceless!! Love Chunky Monkey Ben and Jerry’s I know I would love this!! Ok this sounds like a pretty delicious smoothly!!!! I use to be big into making things like this but have been kinda slacking lately… Need to get back into it!